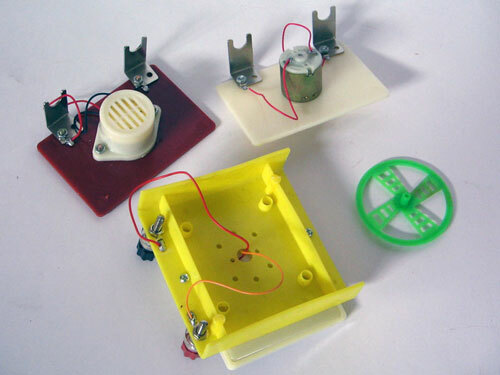 Solar energy cell for demonstrating the use of solar power with a small electric model and buzzer. 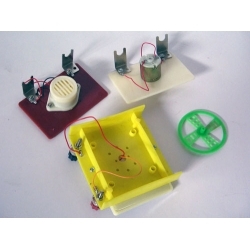 With this set we have possibility to demonstrate examples how light energy reformat into electrical, electrical into mechanical and electrical into sound vibration. Two screw jacks fixed on a support of solar battery, electric motor and generator hook up to these screw jacks by binding posts. For demonstration reformation light energy into electrical energy use solar battery, point this solar battery that light source (sun rays or electric lamp powerful enough) become perpendicular to battery plane. Connect voltmeter to battery posts, make sure in electrical voltage presence. When you connect electric motor with impeller to battery posts make sure that electrical voltage let shaft with the impeller move. It means electric energy reformatting into mechanic energy. When you connect generator with post at the same time you can hear tuneful sound, that demonstrate us reformation electrical energy into sound vibration energy.